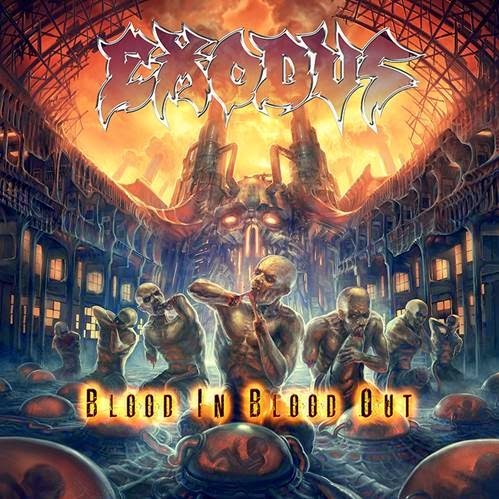 Legendary thrash metal band EXODUS have revealed the never-before-seen album art for their upcoming album, Blood In, Blood Out, hitting retail and digital outlets this fall via Nuclear Blast. The album art was illustrated by Swedish artist Par Olofsson, known worldwide for his incredible renderings that have graced the covers of countless heavy metal albums, including EXODUS’ Let There Be Blood (2008). Blood In, Blood Out is EXODUS’ tenth studio album and marks the band’s first release with returning vocalist Steve “Zetro” Souza since 2004’s Tempo Of The Damned. Metallica guitarist Kirk Hammett recently announced his special guest solo for one of the tracks on the album. Celebrating the imminent release of Blood In, Blood Out, EXODUS will head out this fall with a full South American tour leading into a supporting run with fellow metal titans Slayer and Suicidal Tendencies on the Scion-sponsored fall leg of their United States onslaught. The tour launches on November 11th with two consecutive shows at The Fox Theater in Oakland, California, includes two headlining off-dates, and wraps up in Detroit, Michigan at The Fillmore on December 5th.